Elvis Today: Promised Land Next FTD Release? Promised Land Next FTD Release? If one is to believe the Elvis Presley Fan Club of Great Britain one of the November releases from the Follow That Dream label will be Promised Land. In their October/November magazine it's listed as a November 20 release (2 CD 7" Gatefold, track listing to be announced) together with the Four Days In 56 FTD book. If this is true then it's certainly great news. Promised Land is one of the titles I've been really looking forward to in the classic album series, especially since the top notch Good Times release from FTD in 2009. I actually thought Promised Land would follow shortly after, but apparently the FTD people have been having some difficulty with the tapes, as reported by EIN contributor ElvisSessions from Elvis Week this August. 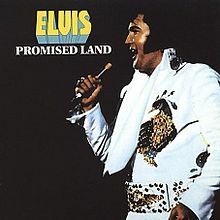 Ernst discussed “Promised Land” as an example of why it's never a sure thing which FTDs will be coming out in what order. He said he expected that album would have been out more than a year ago, but they were having some trouble with the tapes and had to call in an expert to figure out why the sound wasn't coming out as they expected. Does that mean that project is still in limbo? I wouldn't assume so, just that it is an example of unexpected delays. Well, maybe the problems have been sorted out and Promised Land has been getting the FTD treatment and is ready for a November release. On the other hand the British fan club has been wrong before, as recently as this summer the June/July magazine reported that G.I. Blues was "understood" to be one of three July releases. I for one hope the fan club got their facts right this time. He Touched Me and 48 Hours To Memphis followed by Promised Land sounds almost too good to be true. But it's weird, because we had alternates takes from these sessions offically released (BMG, FTD, etc. ), also on import CDs (Venus, etc.) and they sound crystal clear.